i recently did a mini haul from UrbanTouch and come to know this new nail enamel brand Gala of London. i like this color though i think i have similar shade in other brand as well...but thts ok as this one is quite cheap... i stamped this with m44 and m3 using konad stamping polish..
2. comes with a smooth brush. the only con i see is limited range actually they have only 3 colors in the range right now. 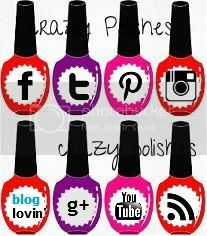 have you also tried these polishes and do u like it ? ?